Some do and some don’t. That is the observance of washing one another’s feet. I’m not going to make a distinction of whether you should or shouldn’t but just that this is a very positive experience that we are told of by Jesus. He says in John 13:17, “If ye know these things, happy are ye if ye do them.” My own stance is that this should be considered as a third ordinance that can be observed with the Lord’s supper or as a stand alone action. I think this not only because the only place to even remotely link foot washing with the Lord’s supper is in John 13, but also for the theological reasons below. Just like baptism and communion, washing the feet of the saints is filled with so many pictures of deep theological truths that make it just to good to pass by. One the men from our church pointed out that this is the biggest point that stands out to him at church. That it really takes someone humble to wash another’s feet. For me, it is even humbling to allow someone to wash your feet. You can see that even Peter had to humble his prideful understanding of Jesus washing his feet in John 13:8. It has always reminded of the caretakers that have had to bathe a loved one who could no longer do it themselves. It is very humbling indeed but in the same sense it is a very honorable duty that is hard to put into words at times. And in our world that is filled with selfish consumerism and individualism we could use more pictures of humbleness. This is the character of the Christian leader. A leader who leads by serving those that they lead. Jesus spoke that servant leadership was counter-cultural in Matthew 20:26-28. The fact that pastors and other church leaders are invited to put the servants towel on and wash the feet of those that they serve is indication of the perspective God desires them to have. We become so used to the world philosophy of use or be used, in other words, use people and love things. Jesus encouraged his disciples to wash each others feet because he did it as an example before them (John 13:12-17). Peter wanted to refuse the Lord Jesus the opportunity of washing his feet. Simply, it was because it was not cultural for the master to wash the servants feet. Notice, the next part of the conversation though. “8 Peter saith unto him, Thou shalt never wash my feet. Jesus answered him, If I wash thee not, thou hast no part with me. 9 Simon Peter saith unto him, Lord, not my feet only, but also my hands and my head. 10 Jesus saith to him, He that is washed needeth not save to wash his feet, but is clean every whit: and ye are clean, but not all. 11 For he knew who should betray him; therefore said he , Ye are not all clean.” (John 13:8-11). Baptism is a testifying symbol that signifies that we have crucified with Christ, buried into His death, and raised to new life by His resurrection. Normally, unlike communion, it is a one time ordinance. In a way, it is also understood as the outward symbol of the inward cleansing that takes place in the moment of conversion (cf. Isaiah 1:16-18, Ephesian 5:26). But what we read in John 13, Jesus shares that washing of the feet is also symbolic of cleansing. So, what does this mean? Just as baptism externally testified to an internal cleansing at our conversion, washing of our feet externally testifies to a continuing internal cleansing, or progressive sanctification where the Lord is helping us to keep our hearts undefiled in this world. Picture it like this. You take a bath (baptism) but then as soon as you step out of the tub and start walking through the world, things start attaching themselves to you. Mostly on the bottom of your feet. Its the part that has the most direct contact with the physical world. The solution then is washing your feet, and by that you feel clean all over again. God has shown us in the washing of the saints feet that He not only has saved us but has grace that keeps working in our life as we pick up some dirt from the world as we walk through it. Cup and baptism together? This is the Lord’s supper and the baptism, but with the added thought of suffering. The true cup and baptism is that the disciples and Jesus would go through intense suffering. But the precursor to this was at the Lord’s table. The meal and the washing were the final preparations to be made before departure. Culturally, the meal and washing was shared as guests came in but Jesus used them as preparations for leaving. Communion and foot washing then are beautiful symbols that point us toward our departure. We know that Jesus shared that the next time he took the supper with us would be in heaven (Matthew 26:29). We also know that Johannine community solely out of all the disciples following observed the washing of feet as preparation for its elderly to pass on and for imprisoned believers and their coming martyrdom. Foot washing is preparation for departure from this world. We wash our feet to set out on a new adventure beyond this world. If this has just peaked your interest in washing the feet of the saints you can check out my short book at the following link. We have heard the phrase, “It is better to give than to receive.” It is probably better to note that this finds scriptural validation in Acts 20:35 when the apostle Paul spoke“I have shewed you all things, how that so labouring ye ought to support the weak, and to remember the words of the Lord Jesus, how he said, It is more blessed to give than to receive.” An interesting note this is one of those instances where we have something that Jesus said that was not recorded in the Gospels. Which just adds to the fact that Jesus did and said much more than what was recorded. Back to our phrase, it really is a blessing to give to people. Francis of Assisi said, “For it is in giving that we receive.” But, why do we keep the blessings from giving to ourselves? There is nothing wrong with giving to those who are not able to give back but why do we rob them of a blessing of not being able to give. I’m not suggesting the idea of being paid back but in paying it forward. Also, for those that only think that giving is money to the poor, there are many more ways to give. Perhaps, in our own personal giving, in our community circles, and church ministries, a deeper understanding of giving is required. The reality is that we all have something to give. This was Paul’s teaching in 1 Corinthians 12 (specifically in verse 7). No one has every gift, talent, or skill known to man, but we each possess something. There is something each of us can bring to the table. Every person can contribute to a community and many times those who are down on their luck or have fallen so far that it feels impossible to get up really just need somebody to come up beside them to help them value and find their gift and put it to use. Pastor Damien is from a place in Cincinnati, OH called “Over the Rhine.” Over the Rhine was highest serviced area in the state of Ohio. Pastor Damien took this gift based ministry mentality and through his church led his community to change. The moment that he took this focus in his ministry was when he came across a drunk man by the name of Charles that he tried to invite to church. Charles told him, “I’m a drunk and I won’t go to church.” Pastor Damien constantly tried to invite him. A few months later during a board meeting, in a side conversation about who the pastor had been visiting, he brought up Charles name. One of the deacons said, “Charles used to be one of the best tuck points around until he fell to alcohol and lost everything.” This caught Pastor Damien’s attention. The next day he found Charles and asked him if he could repair the churches bricks and mortar (this is what a tuck point does). Charles was amazed at this and after some talking on payment he agreed. A few days later on after the church exterior walls had been repaired people were talking about how much nicer the church looked. The next Sunday morning Pastor Damien introduced the congregation to Charles, the one who repaired the walls and Charles couldn’t have looked more proud. Pastor Damien would say, “I couldn’t get Charles the drunk to come to church but I got Charles the tuck point to.” Damien gave Charles value and in turn Charles gave his talents. Everybody has some type of gift, talent, or skill. A lot of people have shared with me that they have no gifts and can not do anything. That is simply not true. What is true is that many have not acknowledged what God has already given. No matter how big or how small. Take a look at the man with one talent from Matthew 25:14-29. He did not use what had been given to him because he felt it was to small. So, it was taken from him and given to another. If we don’t acknowledge what we have and use it then we won’t see any growth or change. For those who have not polished their skills can work to acquire new skills and refinement. For example, this is a place where the church excel with music. New musicians could come and find a place to play. Experienced musicians and singers can take new prodigies under their wing and bring guidance. In the same light, there may young welders in the church that need tips for jobs, help with purchasing equipment, or learning a new technique. The question is how you can help people grow their gifts. One thing we did at our church for the youth was a life skill class before we took them to a Casting Crowns concert. Instead of just feeding them spaghetti we taught how to make them. People around you have gifts. What are you doing to help them discover them and mature them. Once people have discovered their gifts and have developed them they need a place to use them. If your church has a newly discovered group of skilled laborers could there be a ministry to helping the elderly and hurting fix issues in their houses? What about a group of teens that want to do something. Could they go to the local nursing home and play games with the seniors? Counselors? Could they start a addiction and recovery ministry? They people in your church can do something and should be doing something. It is more blessed to give then to receive. So give gifts that help others keep on giving. How to handle a full plate. of the time I am not given a chance to answer them before they are off on another subject or down the road. I really don’t consider myself a over-stretched individual even though I realize that there is quite a few hats that have found themselves on my head. I am not boasting in what I am about to say. Just want to give you my life as an example. I’m a Christian first. Personal devotion and dedication to God is always at the forefront of my mind. Pastoring is a primary calling in my life but at the same the same time there is also primary to my life, the calling and duty of being a husband and father. My time is also devoted to ministerial training as the administrator of Faith Bible Institute and youth ministry as the vice-president of the Christian Baptist Youth. Put on top of that, I have another year on my second Master’s degree and will hopefully be putting the finishing touches on a Doctor of Theology by the end of the summer into next fall. That’s my life in a nutshell and I still feel that I could do more. That is because I’m an not doing this on my own strength and accord. This is how God is working through me. These are some of the steps for you take to handle a full plate by the help of God. Seek God’s vision and grace for your life. I am not able to accomplish much, if anything, on my own. The same goes for you. God’s grace is the enabler of all things in our life. By God’s grace we are saved. By God’s grace we live and it is by God’s grace that we move. Seeking God’s face through prayer and contemplation throughout the day is incredibly important. Sometimes we start mindset of seeking God and attributing praise and dependency on Him by learning to speak, “by His grace” when we are planning. It is also important to seek God’s vision for your life. The apostle Paul had his and it filled him with passion and pursuit. Paul in his recorded trial of Acts says to king Agrippa as he shares his about his conversion, “Whereupon, O king Agrippa, I was not disobedient unto the heavenly vision” (Acts 26:19). Paul had a personal and God-given vision from God. It provided passion and direction for his life. I know what I can do and what God is leading me to because of a personal and God-given vision on my life. What is God’s vision for you life? Take advantage of a calendar. I thank my mom and dad for teaching me the importance of using a calendar. They worked full-time jobs and made time for family and ministry. They knew what was important in their life and their calendar reflected it. There are two good thermometers for our discipleship life in Christ. Our budget and our calendar. Both can point to our focus and our faith. A calendar primarily is beneficial to me for balancing out time. It helps to make sure that my day is not clogged down to where nothing gets accomplished. We can have a lot of activity but no real action. We can become busy bodies that do not get anything done. That is not the will of God and does not help us at all. Utilize a calendar to balance your life and use your time wisely. My hint to you is to have one master calendar per family. The more calendars you have, even personal ones, the more confusion and stress it brings when people update their personal calendars and do not check in with our family members. In the opening paragraphs I hinted at how many different things I do. That wasn’t bragging and it’s probably not news to anyone. I pointed that out because I know that it God’s vision for my life. A holy discontent in my life drives me to do nothing less than what God has revealed in my life to do and to be. It is for that reason that I can say that those pieces in my life are the life abundant things God wants me to do. 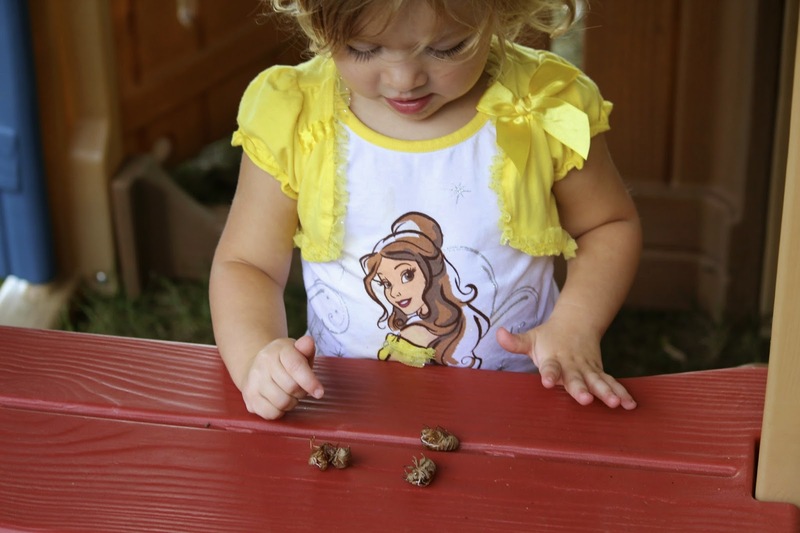 I remember Josie last summer playing with Jar Fly shells (cicada). She had at least five or six in her little hands and she was so proud of it. I caught a live Jar Fly and brought it to her and she was even more excited but a problem presented itself. She could not hold on to all the empty prizes she had and hold on to the lively bug. That’s just like life. There are a lot of good things we can hold onto but God brings us something really great and what it is he really wants for our abundant life. Christ tells us that he came to the sheep (us), “that they might have life, and that they might have it more abundantly” (John 10:10). In having balance we have to learn the things that may be good for us and put them down so that we reach for the great, God’s vision in our life. Even more, what may be just good for me to be involved with and pursuing may in fact be another persons great. Once we know what God’s priorities for our life is then we can begin to find balance in our life as we focus on those things. Be urgent but not rushed. Since I know what God has for me to do there is an urgency or an importance about getting it done. Yet, not at the expense of hurting myself or my family. Balance is still running its course through this. Jesus never hurried but was always steady. Historical leaders in the church called this a “holy leisure.” We are not doing God any good if we rush through His will for us. We make mess ups bigger and, well, messier. We are not slothful or lazy. It is important to move about the things God has put us to with desire for precision and excellence. Which again is only achievable if we go in the grace of God. Several times I have encouraged my congregation to share their “Jesus Story.” It is simply how they were before they met Christ, how they came to faith, and their life now. In order to testify of Christ we do not have to have all the theological terms and nuances firmly set in our mind. We do not have to have a repertoire of scriptures memorized in order to share what Jesus has done in our life. We just have to be familiar with our own story, our own transformation brought about by the grace of God. Look at the trust Christ put into one mans testimony to impact one town from Luke 8. 26And they arrived at the country of the Gadarenes, which is over against Galilee. 27And when he went forth to land, there met him out of the city a certain man, which had devils long time, and ware no clothes, neither abode in any house, but in the tombs. 28When he saw Jesus, he cried out, and fell down before him, and with a loud voice said, What have I to do with thee, Jesus, thou Son of God most high? I beseech thee, torment me not. 29(For he had commanded the unclean spirit to come out of the man. For oftentimes it had caught him: and he was kept bound with chains and in fetters; and he brake the bands, and was driven of the devil into the wilderness.) 30And Jesus asked him, saying, What is thy name? And he said, Legion: because many devils were entered into him. 31And they besought him that he would not command them to go out into the deep. 32And there was there an herd of many swine feeding on the mountain: and they besought him that he would suffer them to enter into them. And he suffered them. 33Then went the devils out of the man, and entered into the swine: and the herd ran violently down a steep place into the lake, and were choked. 34When they that fed them saw what was done, they fled, and went and told it in the city and in the country. 35Then they went out to see what was done; and came to Jesus, and found the man, out of whom the devils were departed, sitting at the feet of Jesus, clothed, and in his right mind: and they were afraid.36They also which saw it told them by what means he that was possessed of the devils was healed. 37Then the whole multitude of the country of the Gadarenes round about besought him to depart from them; for they were taken with great fear: and he went up into the ship, and returned back again.38Now the man out of whom the devils were departed besought him that he might be with him: but Jesus sent him away, saying, 39Return to thine own house, and shew how great things God hath done unto thee. And he went his way, and published throughout the whole city how great things Jesus had done unto him. From verses 34 to 39 we are told of a similar condition of our world today. Jesus has and still changes lives in a drastic way. The world though still does not see the benefit of Christ, only that the changes impact their businesses and morality, not their good He does in families and communities. Jesus did a great work in the man’s life but the people of the community wanted Jesus to leave them alone. They wouldn’t let him do anymore work there. At least Him. The man whom Jesus transformed wanted to stay next to the one that changed his life. Jesus on the other hand had a mission for him. To impact his home city by sharing what “great things Jesus had done unto him” (vs. 39). We are not told of other disciples of Jesus at Gadarenes but that the whole country had a disposition against Christ. This is the people to whom this man lived along side of and would see the change in him. All he had was his testimony. He had no training from Jesus. All he had was his testimony and the command of Jesus to share it at home and in his city. You may think that your ability to impact others for Christ is limited by your education, social status, or financial background. You may have other reasons why you do not think you can. Jesus says you can if you have a firm grip on what He has done for you. Do not ever be afraid to share your Jesus story. If you take the simple request, “What time is it,” and switch the order of the words you can get a deeper question, “Time, what is it?” It is one of the most precious possession that we have but squander it as if it is an infinite supply. For some, time is simply a quantifiable measurement using units of seconds, minutes, hours, days, weeks, months and years. Others mark it by the “moments that take your breath away.” What is time and more importantly to believers, how has the church observed time? Since it really does seem obvious to me that we go straight from Halloween to Christmas anymore, even though the calendar has two major American holidays in-between the two. The second word for time in the Scripture is the Greek word kairos. This is not chronological measurement of time but the understanding of a time period that bears a common likeness or contains significant events with deep meaning or likeness. Here are some Biblical examples to make this clearer. Very quickly we sum these seasons into three groups, Advent through Epiphany, Lent through Pentecost, and common time. Originally the incarnation (enfleshment) of Christ was celebrated January 6 and was called Epiphany. Epiphany is a moment of grasping something or becoming enlightened. The church celebrated first the meaning of Christ being fully man and God around 200 A.D. Christmas became more distinct to be on December 25th around 354 A.D. Advent and the rounding out of the Christmas season is first seen around 380 A.D. So here is a run down of the seasons. Advent: Starts the fourth Sunday before Christmas. Anticipates Christ’s first advent (coming). Christmas: December 25. Celebrating the birth of Christ. Epiphany: December 26-January 6. Reflecting on Christ’s presentation at the Temple, visit of the magi, and His miracle at Cana. The second grouping is the Easter Season. The resurrection to the early church (and us) is the most important event on the calendar (1 Cor. 15:17-19). It is so important that the resurrection is celebrated not just once a year but every Sunday morning. In fact every morning belongs to the Christian as a reminder of Christ’s resurrection and our future one. Every Sunday and morning is a “mini-easter” (Drury, Wonder of Worship, 2005). Easter itself is a week observing the passion of Christ from the entry into Jerusalem to the resurrection. It became a season of observance because of discontent in the early church to focus on this for only a week. Lent (latin for spring) is the 40 days of preparation before Easter some time around 325 A.D. (Mardi Gras or Fat Tuesday was added around 1000 A.D.). Not only was preparation made before hand but celebration after Easter was extended to Pentecost, 50 days after Easter. Pentecost celebrates the outpouring of the Holy Spirit on the Church and for a long time was more celebrated than Christmas. In fact the most important season of celebration is from Easter to Pentecost. Here is the way it falls. Lent: 40 days before Easter. Preparation is made by identifying with Christ’s agony to the cross. Easter: First day of the week (Sunday) and by calendar the first Sunday after the Jewish Passover. Resurrection!!!!!! Pentecost: Sunday after the 50 days from Eater. The birth of the church. The last season the church observes and tells the Gospel story is ordinary time. This is the time between Pentecost and Advent. During this time focus is made on the harvest, that is, evangelism and discipleship. Outreach and spreading of the Gospel was and is the focus of the church during this time. Memorial day, Father’s day, and Independence day over Pentecost. Halloween (especially) and Thanksgiving over Advent. I am not saying there is anything wrong with observing those holidays personally or with the church (at least not all). What I am saying is do we focus, plan, and celebrate those more than the seasons which the Church has historically observed and used to share the full Gospel story each year? Love the Word. Live the Word. Something that I have observed in many churches and individuals is what I would like to call, “Catch-Phrase Christianity.” I have no problem with sermons and Sunday school lessons that have to deal with a word study or a nice little phrase out of a scripture. The problem though is that many times we see this done as purely motivational. Disregarding any context in the scripture. We must be on the guard when we read our Bible for personal devotion and study, prepare a sermon, and a lesson to always be mindful of the context of scripture. How does this word, phrase, or verse fit into the whole of scripture. What is happening to the writer, the characters mentioned, the audience in the context of history. Then and only then can we find our place in the grand narrative of salvation history. It is good to have life or seasonal verses but in order to be Christians that stand strong we must become well acquainted with scriptures, their context, and their application to us. Not in part but the whole. I’ll end with a quote from Dietrich Bonhoeffer’s book, Life Together. The Preacher and the Preaching. Preaching is the leading way that the Lord has chosen for the Gospel of Jesus to be spread. Even though to the world preaching such things, as the cross, are foolish, the people of God know otherwise. It is through faithful preaching of the Gospel message that individuals are saved. The necessity of preaching has always been important and will always be important till the end of time. As John Stott writes “Preaching is indispensable to Christianity” (Stott, 1982). It is not the whole duty of the minister to preach but it certainly is bulk of it. The need of sound Biblical preaching is becoming very evident in today societies. D.A. Carson writes “Biblical theology directly addresses massive illiteracy now prevalent in many of our listeners” <!–[if supportFields]> CITATION DAC08 \l 1033 <! [endif]–>(Carson, 2008)<!–[if supportFields]><![endif]–>. John MacArthur also has to say that, “Generations of preachers facing all the spiritual opportunities and satanic obstacles of this new millennium must rediscover and reaffirm expository preaching” <!–[if supportFields]> CITATION Mac05 \l 1033 <! [endif]–>(MacArthur, 2005)<!–[if supportFields]><![endif]–>. He then goes on to quote Walter Kaiser’s appraisal that the need of the church to be more effective is preaching of the scriptures with purpose, passion and power. It is easy to understand and see in today’s churches that people are illiterate when it comes to the scriptures. Even those that know a bulk of its stories and chronological orders still have a hard time in applying the scriptures to their lives. A large part of the need for preaching is not only helping readers to understand what was taking place in the historical context of scriptures but also in applying the timeless principles learned from those scriptures in their day to day life. “For prophecy came not in Old Time by the will of man: but holy men of God spake as they were moved by the Holy Ghost” 2 Peter 1:21. The scriptures that a minister preaches from is not the work of mankind trying to gain an understanding of who God is, but God’s revealing work of Himself to man. When man speaks the Holy Scriptures he is speaking what God has spoken and when God speaks things happen. “God speaks, and his words are powerful, effective and creative of reality. The God who speaks is the God who acts through his words” <!–[if supportFields]> CITATION Pet04 \l 1033 <! [endif]–>(Adam, 2004)<!–[if supportFields]><![endif]–>. The communication of scriptures is a serious calling and commission of God that should not be taken lightly. First off the Bible is the Word of God. Haddon Robinson writes, “When the Bible speaks, God speaks. This is the conviction that if I can really understand a passage in it context, then what I know is what God wants to say” <!–[if supportFields]> CITATION Had01 \l 1033 <! [endif]–>(Robinson, 2001)<!–[if supportFields]><![endif]–>. A preacher of the Word of God must be a minister of the whole Word of God. There is not a period, a crossing of a “T,” or the jotting of an “i” that is not the Word of God. It makes the scriptures powerful to the minister and to the hearer when they know that the Bible is God’s Word. Secondly, that since the Bible is God’s word is that preaching comes from the approach, “Thus saith the Lord.” The authority of preaching does not rest on the preacher but solely on the Bible. It is God’s disclosure to humankind about Himself. It’s God’s revelation throughout history to man. It is not the preacher’s job then to make the Bible relevant and catchy to the ears of the audience, but to put the Word of God in the ears of people in ways they can understand. “Truth is as relevant as water to thirst or food to hunger” <!–[if supportFields]> CITATION Zon05 \l 1033 <! [endif]–>(Zondervan, 2005)<!–[if supportFields]><![endif]–>. The Bible gives mandates to preaching the Word of God. It is evident in the scripture concerning the seriousness of preaching. The New Testament provides many examples and exhortations to preach. That third scripture, given is from the elderly Paul to the youthful Timothy, is probably one of the strongest mandates to preaching. It tells not only what to do but how to do it. Preaching must be from the Word of God. It is not about preaching the Daily Times, the TV Guide, the latest trend but to preach the Word. The word of God that reproves sin, rebukes waywardness of believers and comfort by the faithfulness of God and teachings of His Word. Very important is that preaching is not just during assigned worship times but can happen at any moment as demonstrated in the book of Acts. Being able to preach at the “drop of a hat” is not just something that happens but is the result of some disciplines a minister will go through if they are serious about preaching. These are prayer, lifestyle and study. “Contemporary preachers who desire God to display His power in their ministries will bathe their preaching in prayer” <!–[if supportFields]> CITATION Mac05 \l 1033 <! [endif]–>(MacArthur, 2005)<!–[if supportFields]><![endif]–>. A praying preacher is a passionate preacher who pursues God in his preaching. It shows that the man is inadequate in his own power and mind to carry the weight of the Gospel and that his success in doing so in found only in God’s provision. The man who represents God in the pulpit should continually seek God’s face and provision in his faithful preaching of God’s Word. Passionate praying leads a preacher into a godly lifestyle. The preacher will guard his heart and mind so that he is not distracted from the Word of God. In the preachers lifestyle it will be seen that he leans on the Lord for his strength and that his heart is turned fully toward God. The prayers and godly lifestyle help to make the preacher passionate in their study of God’s word. Stott writes “Since the Christian pastor is primarily called to the ministry of the Word, the study of Scripture is one of his foremost responsibilities, to which he commits himself at his ordination.” To be ready at anytime to preach is the result of a minister’s life study. It is the result of a minister being fully in tune with God’s spirit through prayer, conduct and attitude and his faithfulness to studying God’s Holy Word. “Time spent in study is never getting away from daily work but getting into daily work” <!–[if supportFields]> CITATION Fre85 \l 1033 <! [endif]–>(Craddock, 1985)<!–[if supportFields]><![endif]–>. Hours in study show immediately on the minister of God’s Word. “Ministers are required to read” <!–[if supportFields]> CITATION Zon05 \l 1033 <! [endif]–>(Zondervan, 2005)<!–[if supportFields]><![endif]–>. It is not a luxury or a choice, but it is a mandate to study the Word of God. It’s not to impress people but to do God justice and represent Him. The ministry of the Word of God is not solely preaching. Yet it is through preaching that God has chosen to save this world. It is through faithful preaching that the Gospel of Jesus Christ is taken to every corner of the earth and is put in the ears of Gods creation. It is through that God picked avenue that people begin to grow in faith and are drawn to God. By prayer and study, preaching is made powerful by God’s anointing and His approval on the minister. <!–[if supportFields]> BIBLIOGRAPHY <! [endif]–>Adam, P. (2004). Speaking God’s Words. Vancouver: Regent College. Craddock, F. B. (1985). Preaching. Nashville: Abingdon Press. MacArthur, J. (2005). Preaching: How to Preach Biblically. Nashville: Thomas Nelson. Robinson, H. W. (2001). Biblical Preaching. Grand Rapids: Baker Academic. Stott, J. (1982). Between Two Worlds. London: Hodder & Stoughton. Zondervan. (2005). The Art & Craft of Biblical Preaching. Grand Rapids: Zondervan.